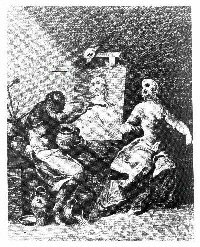 Harlequin Pygmalion: an eighteenth century musical entertainment. In a riotous feast of colour, sound and action, Chalemie presents a rumbustious evocation of the world of a travelling theatre company in the early eighteenth century. Mythology, medicine, music and mime collide with high art in this fully staged and costumed production. Set in the first half of the eighteenth century, Harlequin Pygmalion takes the basic mythological story of the sculptor who falls in love with one of his own creations, and weaves from this a fanciful tale of overweening ambition and its dire consequences. The story is told in dance, music, song and mime as the company recreates the rumbustious world of the comic afterpiece, with its pantomime characters of Harlequin, Columbine and assorted aristocratic fops. The real world in which these entertainments took place is also evoked through the character of the Narrator, in the role of a benighted theatre manager desperate in his efforts to ensure the success of his benefit performance in order that his expenses for a much needed operation for bladder stones might be met. 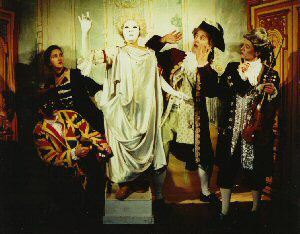 By using original choreographies, period costuming, and historically informed music performance styles, the true flavour of the eighteenth century theatrical afterpiece is recreated. At the same time, the social context in which such performances took place is cunningly established by the surrounding narrative. In this way, the whole piece is intended to be instructional as well as entertaining. A full evening’s performance suitable for family audiences, or shortened for a school production (perhaps combined with workshops or teacher-led discussions) is available.